Who invented the sewing machine is a tricky question to answer. Do you want to know who patented the first sewing machine, or who made the first sewing machine? Are you asking who invented the sewing machine designed for home use? The history of the sewing machine starts in Europe during the 1750’s. These early machines provided the foundation for other inventors to go on to develop a working sewing machine. Developing the sewing machine began in England with German-born Charles Weisenthal. He received a patent for a machine that joined materials using a double pointed needle, but that machine was never built. Thomas Saint patented a machine resembling an awl and a tool with a needle. This machine worked by picking up a second thread and producing a locked stitch. During this time Balthasar Krems of Germany, Josef Madersperger of Austria, James Henderson and Thomas Stone of France, John Duncan, and Americans John Knowles and John Doge were also designing prototypes of a working sewing machine. They all failed. People living before and during the early 1800’s had to sew their clothes by hand. By 1830, Barthelemy Thimonnier had designed and built a sewing machine that used a hand crank attached to a rod to push a needle up and down through fabric. It used one thread, creating a chain stitch similar to an embroidery chain stitch. He built many of these machines and set up a shop in England. Local tailors decided that Thimonnier’s device would destroy their livelihood and they stormed the building, burning it and the machines inside, to the ground. A few years later Walter Hunt improved on Thimonnier’s design adding a second needle and shuttle. His machine could only produce a straight stitch. Inventors continued to work on improving Hunts' design. While many may not be recognized as one of those who invented the first sewing machine, their combined efforts helped to produce the first, fully functioning sewing machine. Massachusetts-born Elias Howe, a trained machinist, devoted many years trying to create a functioning sewing machine. Five years after he began working on the project, he filed for a patent on his version of the sewing machine. He was granted a patent in 1846. His machine sewed a lockstitch by using thread from two different sources. Improving on Howe’s design, Isaac Singer produced and marketed the first sewing machine producing an up and down motion for home use. Allen Wilson developed the reciprocating shuttle about the same time John Bradshaw did. Bradshaw however held the patent. The question of who invented the sewing machine entered the courts with legal woes due to all the competition. Once a working machine was built, many companies started producing sewing machines. Howe filed suit against Singer and other manufacturers and won. By 1856, the men who invented the various parts that created the sewing machine formed the Sewing Machine Combination. Four sewing machine companies, Baker and Grover, Howe, Singer, Wheeler and Wilson joined forces and patents, and forced all sewing machine manufacturers to pay royalties. If a company wanted to make sewing machines, they had to get a license from this group and pay a $15.00 royalty fee. 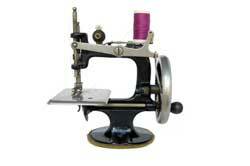 Many of the people who contributed towards inventing the sewing machine are not as well known as Singer. The patent for the working sewing machine expired in 1877. Singer continued to develop a more efficient affordable sewing machine. 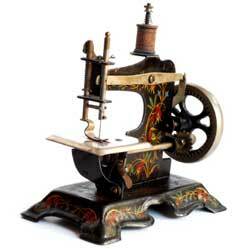 In 1889, Singer introduced the first electric sewing machine designed for home use. While Singer may be more well known, Howe is considered the father of the sewing machine because of his contributions leading to the commercial production of clothing around the globe. Most of the people who worked toward inventing the sewing machine may never be recognized for their contributions. The question of who invented the sewing machine could still debated today. Visit ISMACS International , the International Sewing Machine Collectors' Society, if you’d like to get further details on the history of the sewing machine, including images of these historic models.